This chandelier will update your home with its eye-catching design. Featuring an olde bronze finish and olde bronze shade(s), this fixture will accommodate a variety of dicor styles. With its easy installation and low upkeep requirements, this chandelier will not disappoint. Down facing bell shades for brighter light below where needed. Includes 6 feet of chain for height adjustments. Fixture hangs from matching decorative ceiling plate and is suitable for vaulted ceilings. 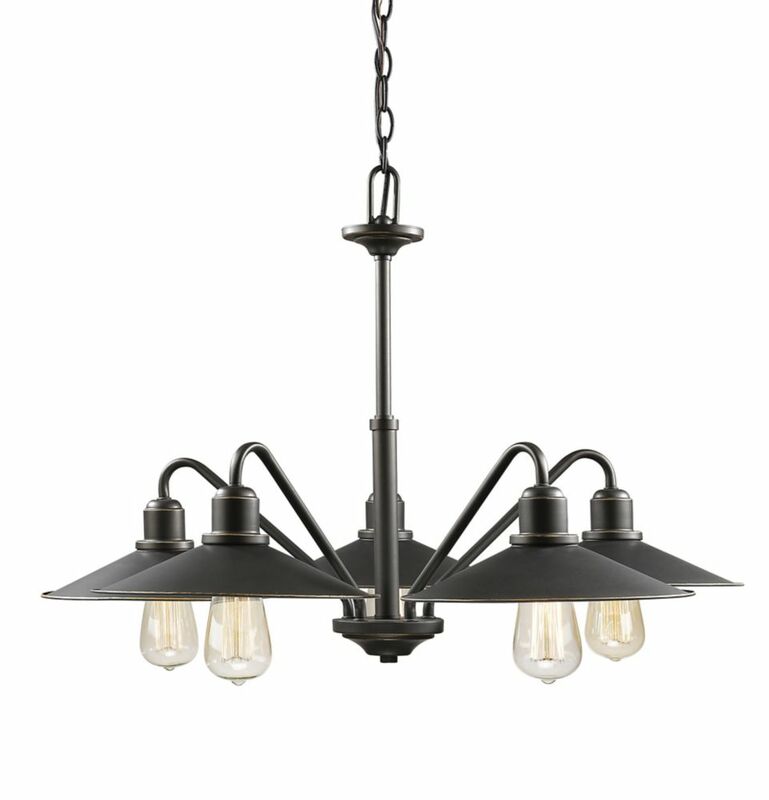 The GRIFFITH chandelier features a black finish with bronze accents.This contemporary style is not only decorative but unique. The metal shades are adjustable and adds additional appeal. This is perfect for the dining and living room. 5-Light Olde Bronze Chandelier with Olde Bronze Steel Shade - 30.25 inch This chandelier will update your home with its eye-catching design. Featuring an olde bronze finish and olde bronze shade(s), this fixture will accommodate a variety of dicor styles. With its easy installation and low upkeep requirements, this chandelier will not disappoint. 5-Light Olde Bronze Chandelier with Olde Bronze Steel Shade - 30.25 inch is rated 3.0 out of 5 by 1. Rated 3 out of 5 by Amy from Light is nice, probably over paid for it based on... Light is nice, probably over paid for it based on further review of other competitve product. Easy to install and came with bulbs.